How heartbreaking is listening to your baby cry in the car?!? I find it soul destroying! My little guy is nearly 9 months and although he’s improved a lot lately, for much of his life, he has HATED the car. Thankfully, we live in a small town and most trips are no longer than 10 minutes because up until recently, he would cry inconsolably the whole time. Now it’s a lot more hit and miss, but this morning he was beside himself and it really made me think. On longer drives, if I can, I get my husband to drive. I do this for two reasons, firstly, I don’t think I’d be the safest driver with my baby crying and secondly, so I can sit with him and offer what comfort I can even though he often still cries and usually ends with me demanding we pull over to give the poor baby (and all of us) a break. It hurts. Physically and mentally it hurts and it aches deep in my soul. This tells me something and it warrants listening to. We are physiologically designed to go to our baby when they cry and to do what it takes to comfort them. It is built into our core. Nature does not make mistakes. We feel this way because to thrive and become all that they can be, our young have needs that need to be met and how to meet those needs is hardwired into us. Ignoring these instincts goes against the biological norm and begs the question how it could possibly ever be seen as beneficial. Sleep Training that involves ignoring a baby’s cry goes against all physiological instinct. It has no basis in science and hurts babies and their mothers. Even if you don’t believe there is lasting implications, you have to ask yourself why doing something that feels all sorts of wrong could ever be what was needed for our babies or our families. Sleep deprivation is a hideous thing but much can be done to assist a family struggling with their baby’s sleeping patterns that does not involve crying. Please, if the sound of your baby’s cry hurts you from the inside out then honour this instinct by seeking gentle sleep solutions! They are available and they are worth it. 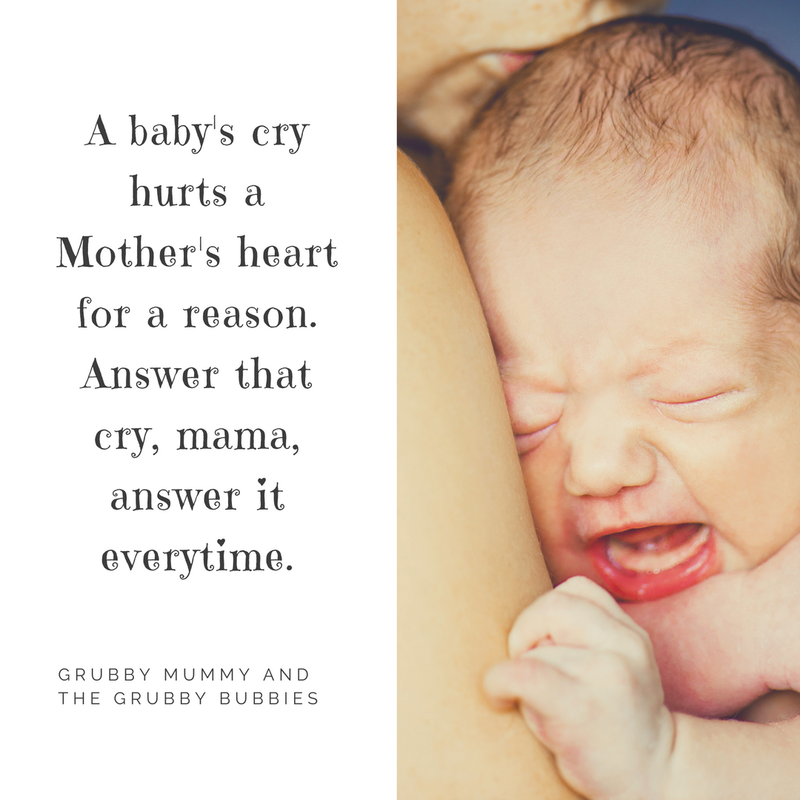 For me, I will continue to honour my baby’s cry as promptly as humanly possible and drive as safely and smoothly as I can so I can wrap that baby in my arms and comfort him as many times as he needs. A crying baby needs comfort. Every time.